April Michelle Davis edits for a living. She reads lots of books and each one at least three times as part of her editing process. She identified two types of editors – developmental and copy. A developmental editor focuses on themes, jargon and the big picture she explained at the Virginia Press Women (now Virginia Professional Communicators) spring conference. A copy editor often is a free-lance editor. She focuses on spelling, style, capitalization and changing passive to active voice. In other words, all the things our English and journalism professors tried to teach us, and that we resisted. “The author may not care about it, but they know they need it to be published,” she said. 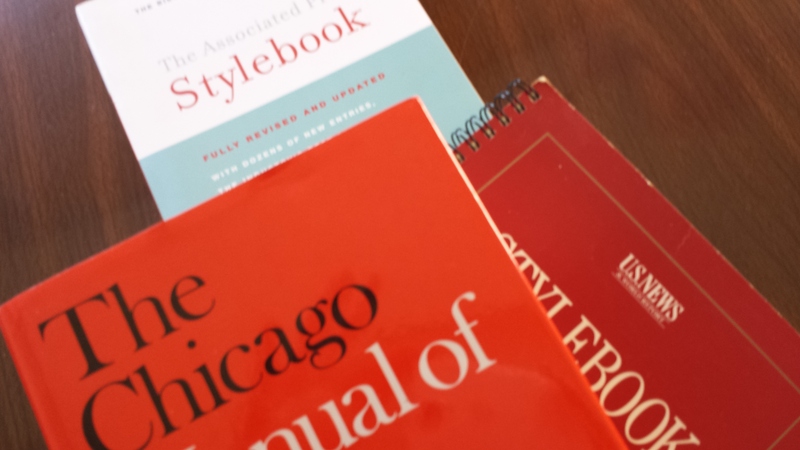 She uses many style guides, including the Chicago Manual of Style (16th edition is the current one) and Associated Press, but noted that a house style manual will override these. As Davis reads the book, she’ll also insert style marks, which she said she can do more easily than the designer because she has read the book. When she edits a book, she does so in track change mode and then locks the changes. The author can then review the changes and note any additional ones or ones that he doesn’t agree to. Keeping track changes locked ensures that the author will complete the process with her. Davis said a good editor must have experience, be trustworthy and know about technology. “There are no tests to prove you are a qualified editor,” she said. She gained her experience slowly over time. Payment for early jobs often came in the form of breakfast. As she continued to do a good job, she was able to start getting paid in dollars. Over time, she gained the trust of authors. Each time she works with an author, she strives to understand what they mean. “I need to be careful to not misinterpret what they want,” she said. For example, if an author tells her to “go at it,” she will probe until she understands what the author’s expectations are for editing. Davis also ensures that all of the systems she and the author use are compatible to ensure that editing changes are not lost. Lots of studies have shown that playing sports helps individuals become better team players and future leaders. That makes sense, but I also think it’s important to have the right coach to provide that guidance. I was fortunate throughout my athletic career (field hockey, volleyball, track) to have great coaches for the most part. I was reminded of this again listening to Gina Lucida, the field hockey coach for the University of Richmond, who recently shared her views on leadership to faculty and staff. I was fortunate to be in the audience. One of the things she stressed, “If you say things, they have to become real.” For Lucida, she wanted to win a national champion and at UR, she has led the Spiders to three Atlantic 10 Regular Season Championships, two A-10 Tournament Championships and two NCAA Tournament berths. I wanted to become president of a national communications group and I said it out loud and a year later, I was president. Of course, there was a lot of hard work in earning that position, just as lots of hard work is involved in winning championships. But if you don’t say what you want, there is no way to make it real. One of the ways I continue to grow is by reading books on leadership and joining with others to discuss them. I also follow bloggers who cover the subject. For about a year I had a coach, too, who helped me continue to refine myself. When I need a tune-up, he’s always available for a call. Athletes also succeed because they are surrounded by like-minded people. They often live in the same dorm, study together and, of course, practice and play together. “You can’t underestimate the power of like-minded people,” Lucida said. I belong to several professional organizations, which greatly helps me. Not only do I learn from subject matter experts, I also develop a network of like-minded people whom I can call when I need advice. Lucida also stressed the importance of focusing on your strengths. While it’s important to know your competition in athletics, you don’t want to spend all of your time focused on them. By focusing on your strengths, she said, you perform at your best. That’s great advice, whether you’re on the field or meeting a deadline. When I was president of NFPW, the one thing I said I wouldn’t address was a name change. I wanted to focus on SNAP!, or sustainability, networking and professional development. And that’s what I did. However, when my affiliate Virginia Press Women discussed a name change, I was all for it. VPW was founded in 1958 as an organization for female newspaper editors and writers. In 1973, membership was opened to men. For too many years, I’ve had individuals (mostly men) say to me, “Oh, that’s that women’s group.” I don’t think they were being derogatory, but that’s how they defined it, and, unfortunately, it often meant they didn’t think as highly of it because they didn’t think it was inclusive. For the longest time, such comments didn’t bother me much, especially given that women still only earn 77 percent of what men do, according to the White House. Keeping the name was a way to further emphasize the need for parity. However, when I made the transition from newspaper reporter to PR practitioner, I often felt as if I didn’t truly belong to VPW because I was no longer “press.” In recent years, I’ve had many potential members tell me the same thing. They didn’t think they could join because they worked for a PR firm, were a solo practitioner, wrote a blog or a book, or coordinated events. Yet one of the things VPW has been so good at is joining all types of communicators and helping individuals transition from journalism to PR or from writer or coordinator to manager or director. The amount of knowledge within the organization is astonishing. More importantly, the members are so willing to share their experience and expertise with others. I’ve learned so much from my peers in this organization. That’s why when the board proposed a name change, I jumped to support it. Of course, I had plenty to say about the name change having gone through one with an organization for which I worked. And many of our members debated it one rainy Saturday afternoon, exploring all options. 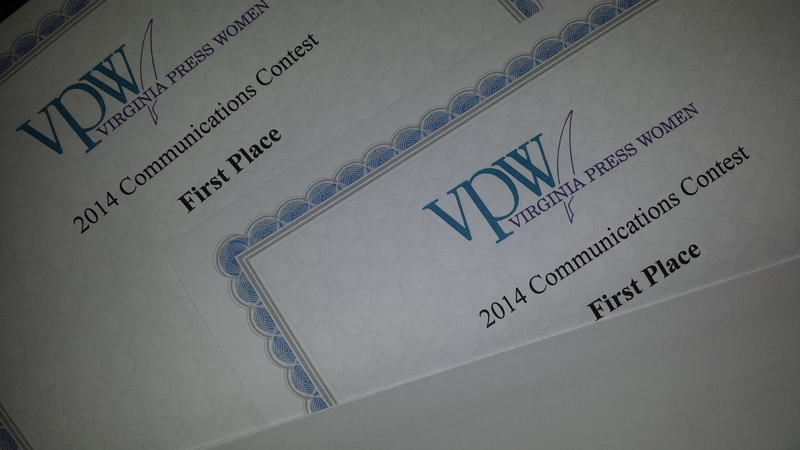 The board took on the challenge and on April 5, members voted to change the name of Virginia Press Women to Virginia Professional Communicators. No matter what we call ourselves, though, our members – be they journalists, PR practitioners, novelists, men or women – will continue to trail blazes. That’s a group that I want to belong to! Working as a solo practitioner can be daunting given that the marketplace is crowded with lots of award-winning journalists. That’s what Robin Farmer, a former reporter for the Richmond-Times Dispatch (Va.) discovered when she first went solo. She realized she needed to do something to set herself apart and to ensure her success. She shared her tips during a recent Virginia Press Women conference. The first thing she did was attend a seminar presented by SCORE, a nonprofit association dedicated to helping small businesses get off the ground, grow and achieve their goals through education and mentorship. The seminar helped her determine the structure of her business and how to set up her website. She also hired a business coach, who helped her write effective pitches. What I really appreciated was how Robin organized her work week with each day having a specific focus. Monday is for marketing because as Robin notes, “You have to constantly look for work.” She uses Marketing Monday to write letters of introduction and to send pitches. On Thankful Tuesday she writes handwritten notes to sources and editors. She always includes two business cards – one for the recipient and one for the recipient to share. Work It Wednesday is Robin’s workhorse day. She sets up her interviews and transcribes notes, for example. Invoices are sent and contracts are finalized on Track It Thursday. The last day of the week is Fiction Friday or Fun Friday. I’ve been working on saying “no” more often so I would have more time. More time for what? Anything or nothing. But sometimes, I forget and I over commit. I say yes to a writing process blog tour. A writer I know reached out to me as asked if I would be part of this writing process blog tour. Shawna Christos is a writer with several books in various stages of dress and is currently working on a mainstream commercial fiction book. A long-time volunteer and supporter of James River Writers, you will find her at a lot of the JRW and local book events. She’s also great at encouraging writers – like me – who need reminders to keep working on their book. And she gets some of us into trouble by getting us to say yes. I had to answer four questions. I think I was also supposed to identify other writers and have them do the same, but I don’t think that part is going to happen. Not because I don’t want to hear from others, but because I’m going to run out of time. At the least, I will answer the questions, which were picked by someone unknown to me. I started a mystery several years ago, and at some point, I will pick it up and finish it. Right now I like to say it’s marinating. In the meantime, I post regularly to this blog and do lots of writing in my professional job. I’m thinking about collecting posts from the blog and publishing a book for those early in their career. I’ve had several students and young adults tell me how hopeful the posts are and another friend has encouraged me to do this. Now, I just need to commit to doing so. I also am involved in my local library so I get to meet lots of great writers and am part of a book club so I’m reading great writing. All of this, I hope, will enable me to be a better writer, and, at some point, a published author of a mystery. My mystery does have a unique protagonist. I can say this because I met with an agent several years ago at a James River Writers conference, and she told me this. She was quite encouraging. I think that scared me! I once worked in law enforcement and some of what I learned will make it into the book. That, I think, will help make the story more real. I guess time will tell. I love mysteries. From the earliest age I was reading Nancy Drew and the Hardy Boys. Then there was Agatha Christie. I consume mysteries. If I get a new book by Janet Evanovich, I’m finished in a day or two. A new Michael Connelly novel puts my life on hold until I finish it. When my book is finished, I hope it has the same effect. Reading is a great way to disappear into another world for a short time. I started my blog as a means to communicate with members of NFPW when I was president, 2009-2011. I continued the blog because I had gained a following and heard from many that the posts were helpful. I also found the discipline of researching, writing and posting twice weekly beneficial to me as I continue to grow as a writer and leader. Since I haven’t worked on the book in some time, I clearly need to develop a process. I do clip news stories that could become fodder for story lines, and I keep a journal of sorts that outlines chapters and keeps the details of each character. A friend pointed out to me that because I now have leave between Christmas and New Year that would be an ideal time to make significant progress on the book. She’s right. So ask me again in January 2015 how the book is coming. 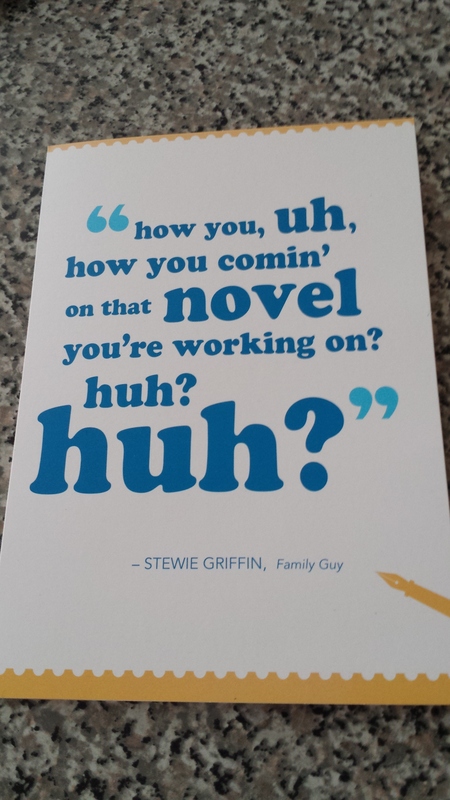 A former colleague gave me a card that asked me how I was coming along with the novel. I keep it on display as a reminder. I’m much better with the blog. I create a schedule each year for the days I will post and then I identify relevant topics, such as conferences and national days (Sunshine Week, for example). I am always reading and researching and as a former reporter, I know how to find and develop stories. I always say that if I have attended a workshop and can’t get a blog from it, then it was a bad workshop. Of course, like any good writer there are those days where I just can’t get it together and I’m scrambling to get the post written by my self-imposed deadline, or, in this case, by a deadline that I should have said no to. Having said that, I had fun answering the questions. I’m sorry I didn’t work to get other writers to participate, but I know there are several of you out there who read this blog. If you’re game, please participate by answering the above questions and posting on April 21. If you send me a short bio and a link to your blog, I’ll post on Friday with links to those who will participate in the tour. The hard part is sitting down to write it. Or sitting down to write the article that is due in two hours… or the speech that is due on Monday. Write every day. You can write in a journal. You can write a letter to a loved one. You can write one page of your novel. At the end of the year you would have 365 pages. Don’t write to impress. As a college student, I knew how to turn a short sentence into a longer one so I could hit my word count. I liked using large words – the better to show off my vocabulary. Readers don’t care about that. They want a good story. Read good writing. Some of the best writing I know comes from writers for Sports Illustrated. Think about it. There are two teams or two players. One wins, one loses. This happens over and over. How do you make it exciting? 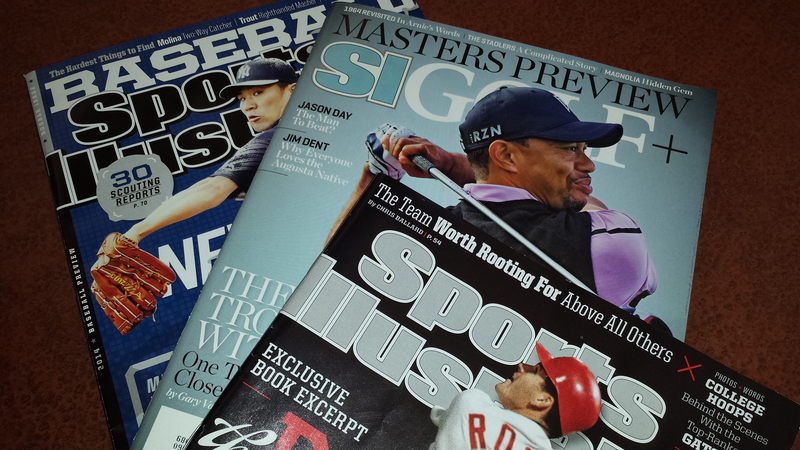 Read Sports Illustrated and you will find out. Read the classics. Read anything and identify what you don’t like and why. Then don’t do that. If you find something you like, strive to be that good. Shorten what you wrote. After I finish writing an article, I check the word count and then attempt to delete 10 percent of it. Almost always, the writing becomes stronger and more powerful. Check the verbs. Passive voice is quite dull to read. If you aren’t good at this, take a highlighter and identify every very. Then you can change the passive verbs to active. You’ll see a difference in your writing. Read for inspiration. I aspire to publish a mystery. I read lots of mysteries and now know the specific type of mystery I want to write. I know the setting of the book, too, and so I read travel books from that location. Now stop reading this and go write. And yes, I know I need to take my own advice and finish the novel!